If you are lucky enough to have $25,000 or $35,000 to throw around on a custom guitar stylized to look like a prop in your favorite dragon soap opera, then Fender and Game of Thrones have just the cross-promotional merchandise for you. The Fender Custom Shop designed three Game of Thrones-themed guitars named after the Stark, Lannister, and Targaryen houses. The bespoke Game of Thrones House Stark Telecaster, which “was painstakingly crafted by Principal Master Builder, Ron Thorn” will set you back $25,000, which sounds expensive until you realize that the case is lined with faux wolf fur. The House Lannister Jaguar costs $30,000 and the House Targaryen Stratocaster costs $35,000. It’s not like your kids needed to go to college anyway. 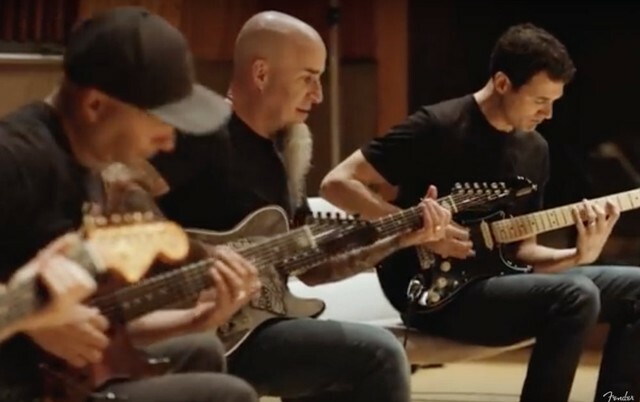 You can watch the guitars in action in this demo video that features Game of Thrones creator and show runner D.B Weiss and Game of Thrones composer Ramin Djawadi perform the show’s opening theme with Tom Morello, Scott Ian of Anthrax, and Nuno Bettencourt, who apparently hasn’t aged since Extreme shot the “More Than Words” video. Unfortunately, no one tied a shag throw rug around their shoulders all Jon Snow-style while jamming out. Each guitar is hand built to order, and honestly, if you’re going to spend the cost of a year’s worth of private school tuition on a guitar, it might as well look like something your favorite TV character would play.